Nutan Samarth Bahl, better known by her screen name Nutan, had a four-decade long career in the film industry that she built on her own terms. From slapping a co-star who spread rumors about their relationship to receiving a record number of awards, she was a force to be reckoned with. 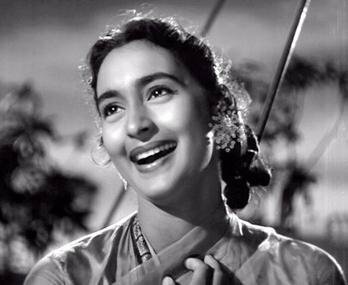 Nutan was born into a Marathi family, the oldest of four children, to director/poet Kumarsen Samarth and his actor wife Shobhana Samarth. 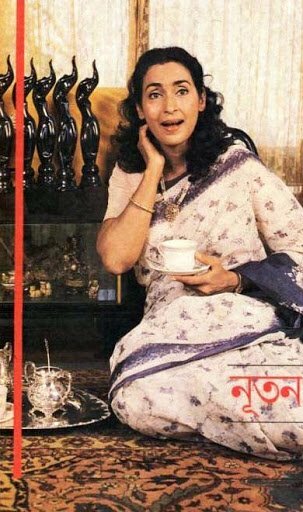 Her younger sister Tanuja, Kajol's mother, is also an actor. When she was still a child, her parents separated. When asked about living without her father, she said, "My parents separated and I met my father rarely. A few months before he died, when he was ill, I got to be close to him. I wish I had spent more time with him. It is one regret and guilt I can never get over. Not only because I couldn't be the daughter I would have liked to be, but the immense loss that I felt on not being able to spend more years of my life with such a warm, caring, and brilliant man. He could have enriched my life so much." But she was close to her mother. She said, "I wasn't proud, but rather pleased about being recognized as Shobhana Samarth's daughter. Once during a school show, a teacher who was dressing me up suddenly said, 'you look like Shobhana Samarth. Are you related to her?' I stammered, ‘S..s ..she's my mother.' Years later, my mother met someone in Europe who asked her if she was related to an Indian actress called Nutan!" The actor started her career at the age of 14 in the film Hamari Beti, and by the time she was 17, she was a well-known name in the industry. But after doing a few films, she went away to study in Switzerland. She was still getting offers when she left, though. She explained, "I was terribly thin and within the industry there was a joke that if you want to draw Nutan, just draw a straight line. My mother even feared that perhaps I had TB. So, at 17, despite the fact that I had so many film offers, my mother sent me to a finishing school in Switzerland. The one year that I spent in Switzerland was the happiest in my life. I could play, study, be free, and catch up with what I missed in my teenage years. I did a secretarial course which has paid dividends several times over. I do my typing, accounts, tax matters, every clerical job required to keep my money matters straight. I learnt French, which I can still speak and write. When I returned to India, I was 40 pounds heavier, and then began a wonderful phase." 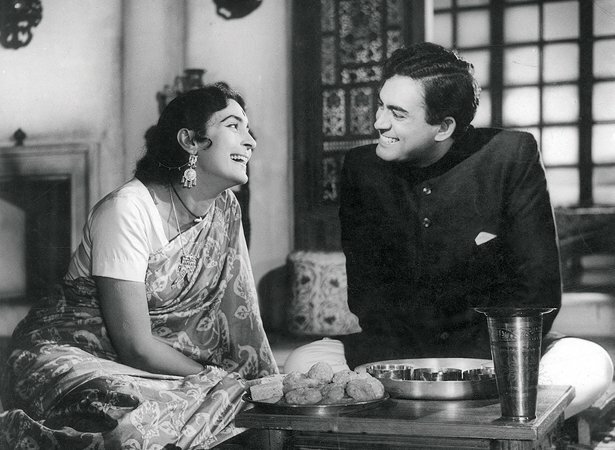 After moving back to India, Nutan came back into films and didn't look back. She still holds the record for winning the most Filmfare awards for Best Actress. It was only in 2011, after 30 years, that her niece Kajol matched up by also winning five awards in the category. She is, overall, the most-awarded female actor, besides Jaya Bachchan, with six awards for her performances. In 1974, she was awarded the Padma Shri. But, despite everything, she never let any of it get to her head. She said, "I got a lot very early in life. I feel I have achieved everything in the right time, but I have managed to maintain it a little while longer than many. With actors or actresses, it's a fade out or a fade over to another category in 15 years' time. I was a leading lady for over 30 years and my transition was gradual and smooth. Yes, I do feel a sense of achievement. But the credit doesn't go entirely to me. Luck had a big hand in it. I must admit I've had it easy, though." But her life as an actor was not one without any controversies. She once slapped actor Sanjeev Kumar because he was making statements about their alleged relationship. Talking about the incident, she said, "My slapping Sanjeev Kumar became a much-talked about incident. He made a very careless, irresponsible statement about having an affair and that made me furious. I have never been linked with scandals and when he said what he did, I flew off the handle. I had to put him in his place. After I said what I had to, I cooled down and said, 'let's finish the love scene,' and we did." On 11 October 1959, she married naval Lieutenant-Commander Rajnish Bahl. 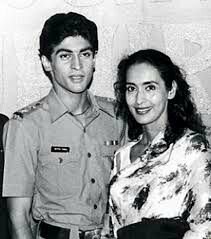 The two had a son, Mohnish Bahl, in 1961. Though she announced that she wouldn't come back to the films after her wedding, she came back on her husband's insistence. She said, "Sujata, I thought, would be my last film, as I was getting married and naturally presumed that house and family would take precedence. But Rajnish said, 'If you were a painter or a writer, I wouldn't have asked you to stop your work and I won't, although you are an actress. Continue, by all means, but do fewer films, choose your roles.' Being a naval officer's wife was a different experience. I hardly socialized or went for film parties. It was just work and home before marriage. But now, we had naval ship, parties, and what have you. Our socializing increased. Almost every night we'd be out." In 1991, a 'biting sensation' in the armpit turned out to be breast cancer. Nutan returned the signing amount for the films she'd signed, and asked the producer of Garajna to complete her portions soon. By February 21, 1991, her cancer had spread to her lungs, and at the age of 54, she breathed her last.